Rob was born in Bergen op Zoom (The Netherlands) in 1984. Inspired by his family he started playing the guitar and singing at the age of 13 and he has always been convinced that his mission was to be on stage. This idea has never changed since then! He started playing with local bands such as Fizzgig, The Twinkys, but not before long he joined bigger acts like Kitsch, Starkoo and later Big Shampoo & The Hairstylers. For the past couple of years Rob has been playing a lot in the Rock&roll, Americana scene and it was only a matter of time before he crossed paths with Danny Vera . They met on one of their gigs, jammed for a while and it became clear right away that Rob could add a new dimension to Danny's very succesful band, Danny Vera & The Ordinary Men. After the club tour in the 2014-2015 season, the "New Black&White Tour" will visit all major theaters in the Benelux. 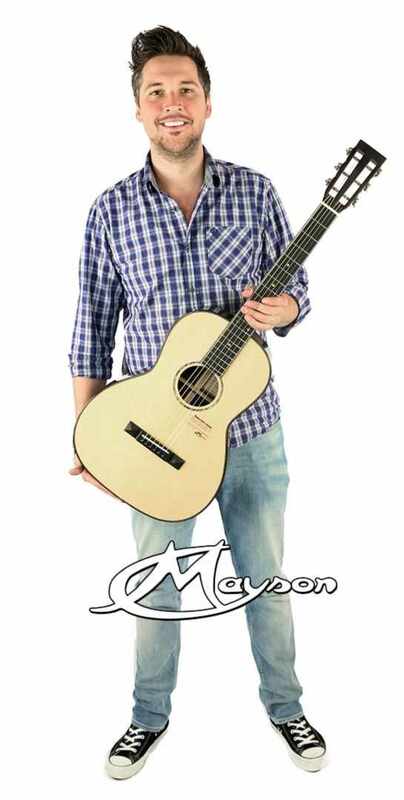 From all fine guitars that are around these days Rob chose Mayson guitars. He doubted between the Marquis models but eventually fell in love with the custom shop Parlor model CS-1802 inspired by ancient guitars and made from the finest Santos Rosewood with European spruce top, mahogany neck with ebony fingerboard. A warm sound that perfectly matches his vocals.